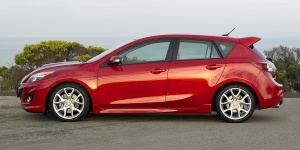 The Mazda 3 is completely redesigned for 2010. Featuring more aggressive looks and a high-quality interior, the new Mazda 3 gets a larger and stronger optional 2.5-liter 4-cylinder engine and 6-speed transmissions. The predecessor's great handling is retained. A Mazdaspeed3 version remains available.